Home / Articles / BECOMING BETTER THROUGH COMPETITION! So many times I have heard the phrase … “Why should I compete? I’m not as good as those other Flair guys?” and my answer is usually the same …”Because you learn something from just about every time you compete”. Do you think if “those guys (and girls)” they are referring to had the same mentality and decided not to compete back in the day, What if they said “Why should I compete when I probably won’t win any money or a trophy”? Do you think they would be as good as they are now? Hell NO! They decided to compete. Even when they might have been scared and unsure of there potential talents. I say potential talents because they had to develop those skills before they were mastered. They didn’t start off being great and able to juggle twelve bottles the first day they decided to evolve from a bartender to a Flair bartender. They evolved into the true masters there are today because of their hard work, passion, dedication and ability to take chances. That’s all I’m asking from you… take a chance, go on an adventure… you never know where you might end up down the road? I know from experience that I am a much better bartender now then I was before I started competing in Flair bartending competitions. Then again if you asked me back then, I was arrogant and thought I knew everything about the industry. The beauty of the naive… you are only as good as your surroundings. I was the best bartender in town (again in my own opinion) and when I would sit and watch other bartenders at work I would point out little things they were doing wrong. Come on we have all done it…“If he did this he could have saved three steps” or “I would have taken all their drink orders at once instead of one at a time”. We have all been guilty of it from time to time. That doesn’t mean there is anything really wrong with that, it just means you are getting familiar with your surroundings. Remember what I said earlier? “You are only as good as your surroundings”, well you compare yourself to the others in your field around you. It’s only natural to compare, to see where we stack up against one another or how we compete against one another? So this curiosity of competition is natural. If you care about something and how well you are at doing it you will only start to wonder how well you do it compared to others and the limits of your talents. A great way to do this is through competitions. Competition is great for many reasons. It causes a change in environment and behavior. Which sparks new ideas, imagination, increased moral, friendships, opportunities, energy, excitement, ownership, anticipation, heightened performance and behavior, new talents and learned skills. “The Hawthorne Effect”… spelled like the “Hawthorne Strainer” we use behind the bar, look it up. The Hawthorne Effect describes a temporary change to behavior or performance in response to a change in the environmental conditions. This change is typically an improvement. New talents and learned skills… now that is what I am going to focus on now. In many major Flair bartending competitions there are usually more then one round. At times there are an Accuracy round, Speed round, Working Flair round, Exhibition Flair round, Specialty round, Mixology round, Tandem rounds, Head to Head rounds and much more. When you are competing in these competitions, it is only natural to want to do well. How do we help achieve this…? By practicing for these events before the actual competition. Much like a golfer who practices there swing, eventually they get better and put the ball in the hole in less tries. The same with Flair bartending competitions, you practice Accuracy rounds so eventually you will pour more accurately using both hands better then before. You practice Speed rounds to become faster and remember more orders so eventually you become a faster bartender then before. You practice Working Flair and Exhibition Flair rounds to have more confidence and variety in your moves so eventually you become more entertaining at work behind the bar without sacrificing service. You practice Mixology rounds to understand how different spirits and flavors mix so eventually you make better quality and original cocktails behind your bar at work. All of these things are helping to make you become a better overall bartender. Thus making you and your venue more money behind the bar and making you a more valuable bartender in the process. When you immerse yourself in higher skilled surroundings you have the potential to become better. Remember what I said earlier? “You are only as good as your surroundings”, so when you raise the bar of your surroundings you are raising the bar for your learned skills as well… thus making you a better overall bartender. If you think you are good bartender now? 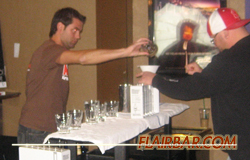 Start competing and push the limits of your talents and become a great Flair bartender. See where it takes you? Take a chance; go on an adventure… you never know where you might end up down the road?